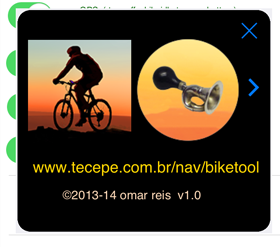 Btool is a bicycle computer and trip logger app. It uses the phone sensors to collect trip statistics. The route points are used in aggregate calculations, displayed on maps and charts. Route data can be shared. 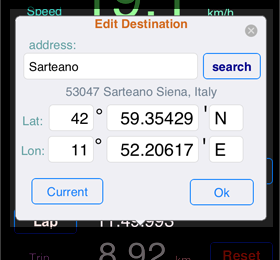 The app has 3 pages: GPS, Map and Options. You may set a destination. The same button is used to start and stop the timer. Click [Start] to start your trip. Clicking [Stop] pauses the timer. Start again to continue. 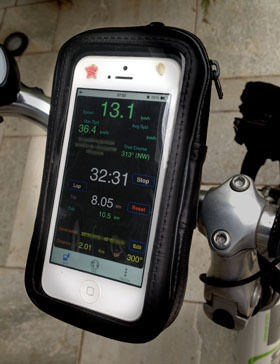 App can be set to stop the timer automaticaly, if the bike stops for more than 30 seconds. It will only save point data if the trip was started. While stopped or paused, no points are saved. [Reset] sets everything to zero, to start a new trip. [Lap] shows a split time. Street address from Google Maps. Use the reload button to update. Or set it to Auto mode and have it updated every 30 secs. Map including the current Trip (red line), destination marker (red pin) and current position (bike icon). This uses Google Maps and requires internet connection. Speed and altitude over time charts. The reload button to the right of the chart is to reload the map. You may use Altitudes from the phone GPS sensor or Google Maps. See Options tab. Page Options keeps the program configuration. Use [x]GPS Switch to turn off the GPS feed and save battery. Program starts with the GPS on by default. This must be on while riding. Beep on position activates/deactivates a sound when GPS ticks. Moving average for speed applies a moving average (exponential) to the speed, to smooth it from random variations. Sometimes a small error in GPS position makes the speed volatile. Auto update street address controls the automatic update of the address panel on top of the map. If on, address is updated every 30 secs. Deactivate to save on Internet access. 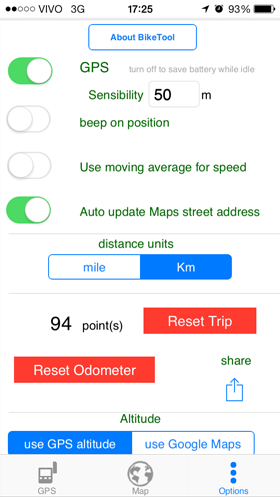 You may choose distance units in miles or kms. 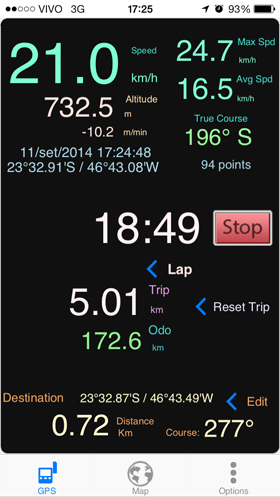 Resetting the Trip clears all track points and zero the trip distance, time, max speed and average speed. Reset Odometer does just that. You can share your trip points by email, Facebook or copy/paste to a Note. Format is readable by spreadsheet programs. Coordinates can be searched in Google Maps or manually edited. In this case, use degrees and minutes, as shown. Use the dot "." as decimal separator. The About panel has a link to this page and a useful horn. Tap it ! Btool stores your trip data to a local file. You may share the data in textual format with other devices, using the phone standard sharing mechanisms ( e-mail, clipboard, note, using [Share] button in the options page ). 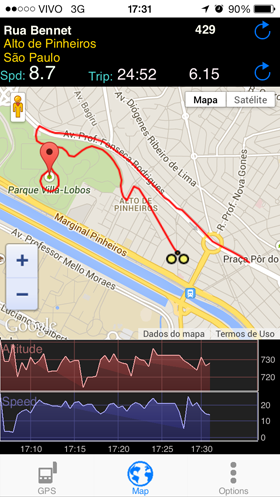 You can share your route on site www.btool.com.br. Shared routes receive a redeem ID, which can be passed to fellow bikers. If street address is enabled, Btool uses Google Maps* service to obtain the current street address. The same goes for Google Maps altitudes option. If any of these options are enabled, the internet is used periodically while moving.